¶ 2 Leave a comment on paragraph 2 0 Drifter’s Escape really works. 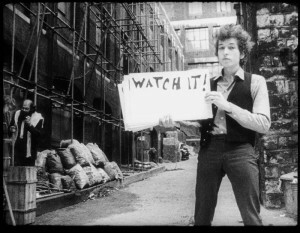 Dylan successfully walks the tightrope he consciously built for himself with this album (“What I’m trying to do now is not use too many words”), limiting the number of words while still telling and effective story. Drifter’s Escape while very succinct, still has a beginning, middle and end, and a transformation of the narrator’s plight. Unlike a few other songs on the album, it hangs together with repeated listens, balancing between being frustratingly vague and mind-numbingly simple. And that’s not to mention the effectiveness of the music, and the killer harmonic solo at the beginning. ¶ 3 Leave a comment on paragraph 3 0 The legendary songwriter Richard Sherman, the co-author of many great songs such as Chim Chim Cher-ee and It’s a Small World, once said that a song “has to be a book on the head of a pin. 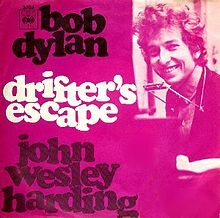 That’s what a good song is.” I think Drifter’s Escape passes that test. But left looking just like a ghost. ¶ 10 Leave a comment on paragraph 10 0 Shelton, like both the writer of the Wikipedia entry for this song and Dylan commentator Paul Williams, note the similarities to Kafka‘s stories of unjust persecution. ¶ 11 Leave a comment on paragraph 11 0 Many commentators have suggested that it’s God himself that saves the drifter with the bolt of lightning from the sky. Shelton notes the influence of the Old Testament in the rhythm and meter. ¶ 12 Leave a comment on paragraph 12 0 It’s not hard to imagine Dylan thinking about his own personal history while writing this song about an unjustly persecuted man. Having been venomously attacked by so many groups for simply following his muse to new areas – first by the folk traditionalists, then the political crusaders, then the anti-rock crowd – it’s easy to make the connection. ¶ 13 Leave a comment on paragraph 13 0 I also wonder if Dylan had his old favorite, Woody Guthrie, in mind as he wrote it. Many Guthrie songs echoed the same theme. See Ramblin’ Round, where Woody identifies with the drifter, and Hobo’s Lullaby, which contemplates the unjustified persecution of the drifter (Guthrie didn’t write Hobo, but recorded a popular version). ¶ 14 Leave a comment on paragraph 14 0 Drifter’s Escape was released as a single. ¶ 16 Leave a comment on paragraph 16 0 Dylan did not perform Drifter’s Escape live until 1992. He played it for the first time, probably not a coincidence, the day after the Rodney King verdict. ¶ 17 Leave a comment on paragraph 17 0 The song is performed live in Dylan’s film, Masked and Anonymous. The character played by Penelope Cruz says “He’s great, I love his songs because they are not precise, they are completely open to interpretation”. True dat. ¶ 19 Leave a comment on paragraph 19 0 Jimi Hendrix did a version. ¶ 21 Leave a comment on paragraph 21 0 Here’s a pretty good homemade video of an excellent performance.